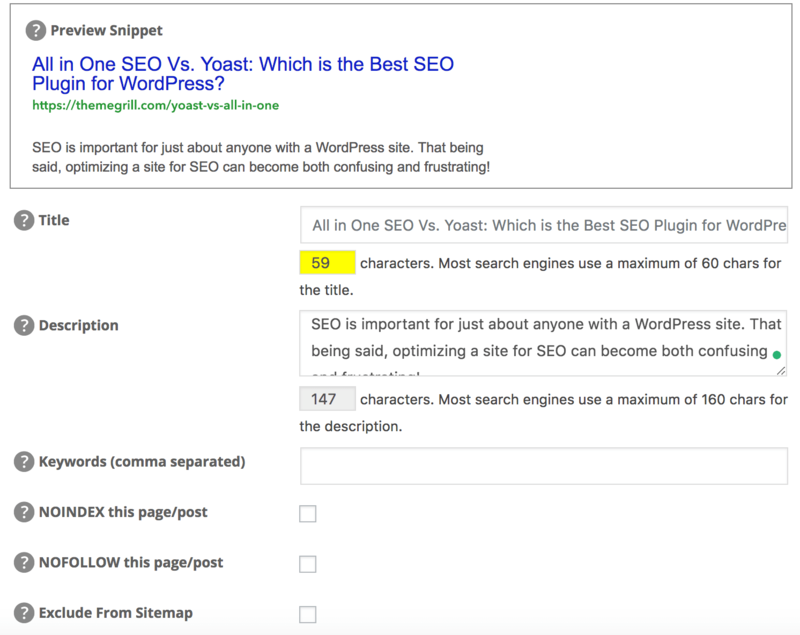 All in One SEO Vs Yoast: Which is the Best SEO Plugin for WordPress? SEO is important for just about anyone with a WordPress site. That being said, optimizing a site for SEO can become both confusing and frustrating for those that are just getting started – and for seasoned veterans too! Thankfully, some really great SEO plugins exist on WordPress, and they help to make every site owner’s job just a little bit easier. There are a variety of plugins that attempt to be the go-to SEO solution for WordPress users, but over time there have been two that have risen to the top. The first of these plugins is All in One SEO Pack. All in One describes itself as one of the original SEO plugins for WordPress, but it’s still being used by over 1 million active users each month. The other SEO plugin that’s worth paying attention to is Yoast SEO. Even though Yoast seeks to serve in the same way that All in One does, there are a few key ways that this plugin sets itself apart as well. 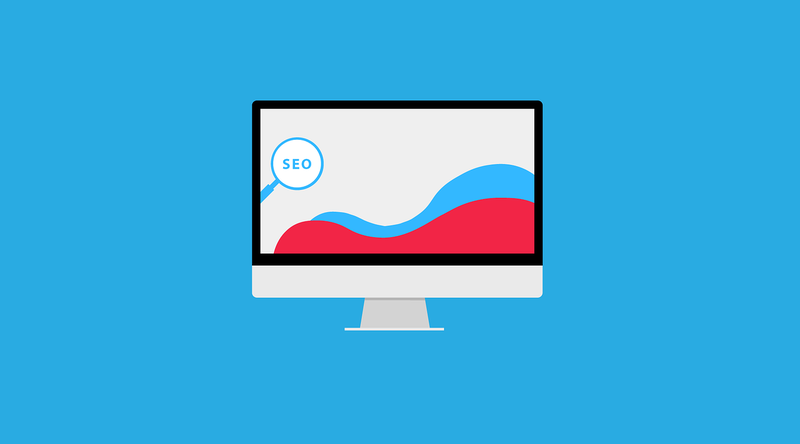 In this article, we’re going to be comparing and contrasting the two SEO plugins to determine which you should consider installing on your site. Keep in mind that both of these plugins are popular for a reason. While there may not be a clear winner that everyone can agree on, Yoast and All in One are different enough that after reading this, it will likely be clear which you’d prefer to work with. Before we dive into comparing Yoast SEO and All in One SEO Pack, let’s take a step back. Essentially, both Yoast and All in One do one simple thing – they make complicated tasks simple. On the other hand, don’t fall for the idea that downloading an SEO plugin is a hassle-free way to the top of search engine result pages. Neither plugin will create content for you. In both cases, you’ll have to develop the content yourself. These plugins will simply help you to ensure that the content you’ve created stands on a technically sound base. Catch this: Technical SEO is always second to great content and proactive off-page SEO strategy. 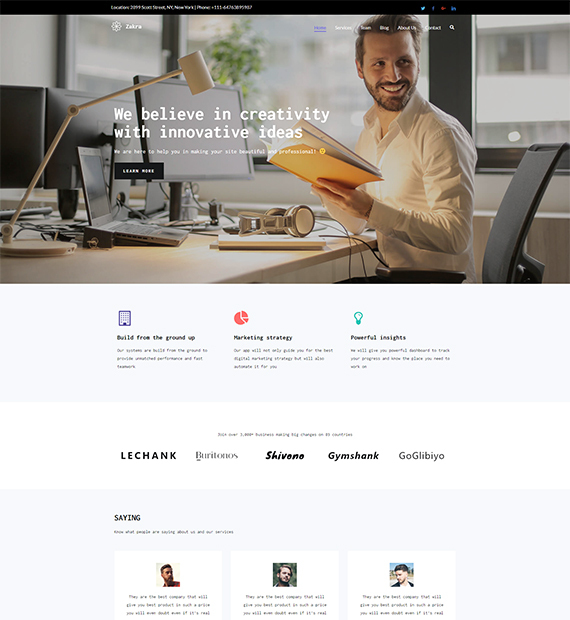 The developer insists that WordPress provides a great framework for SEO out of the box and that Yoast simply exists to fill in a couple of gaps.As a plugin, Yoast is a powerful tool that offers a wide variety of functions. It’s known for efficient, effective functionalities and consistency in results. While Yoast has been known to constantly deliver, some people view its layout as both convoluted and confusing. The plugin is known for menus that are split amongst several pages and additional features that are loved by some and hated by others. That being said, Yoast does allow for some control over the user interface. It’s possible to disable the “Page Analysis” feature that’s famous for its uniqueness among similar plugins. While some users love this feature, disabling it definitely simplifies the plugin’s menus and options. In addition to that, some users do hate the analysis features, and the potential to disable them is important. In many ways, All in One SEO can be considered as the original “out of the box” solution for WordPress SEO. The plugin’s known as simple, clear, and concise. Unlike Yoast, All in One offers most of its options on one page. 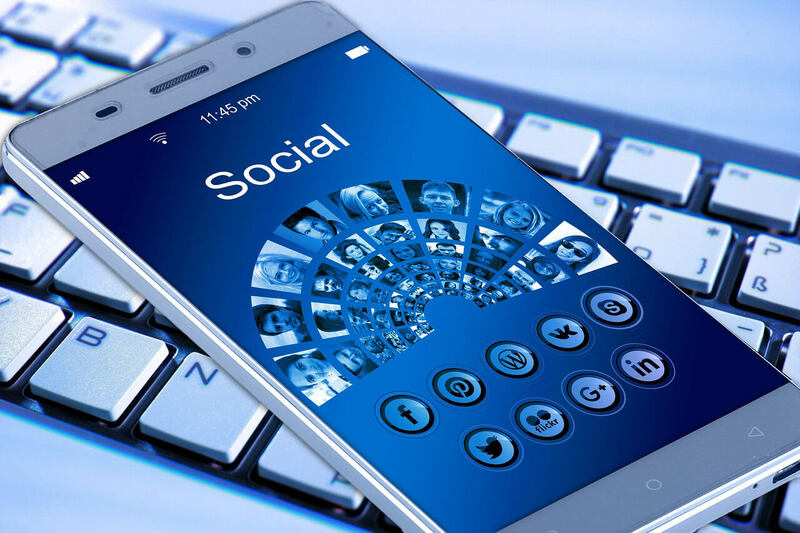 In isolated instances, my experiences have led to trouble with All in One’s social integration features, but outside of that, the plugin works well in delivering the results that it says it will. All in One also offers some batch editing features that Yoast lacks. If a whole site’s SEO strategy needs to be updated or if several pages need SEO titles, meta descriptions, etc. then All in One makes it easier to update everything at once. For an SEO plugin, this is extremely important since any SEO plugin should be focused on making optimization efforts simpler and more efficient. If All in One and Yoast worked in the exact same way and produced identical results, then there would be no reason to write this article. Both Yoast and All in One provide very similar services. However, the way that they are designed and the added features that they offer are what make them so unique. Yoast SEO is a plugin that’s available within the WordPress Plugin Directory. Like with any plugin, simply install it onto your site and then activate it after doing so. Right out of the box, you’ll notice that Yoast integrates itself into your site’s “Edit Pages”. Any time you start editing a post or a page, you’ll notice the Yoast SEO tab. There are 4 important tabs to be aware of within the Yoast tab – two of which fall under the “Content Optimization” category – the Content Optimization options represent a lot of what makes Yoast unique. The first in this category is the “Keyword” tab. Focus keywords provide the foundation for any optimization effort on Yoast. Before doing anything else, decide on the keyword that’s most relevant to the content you’re creating. 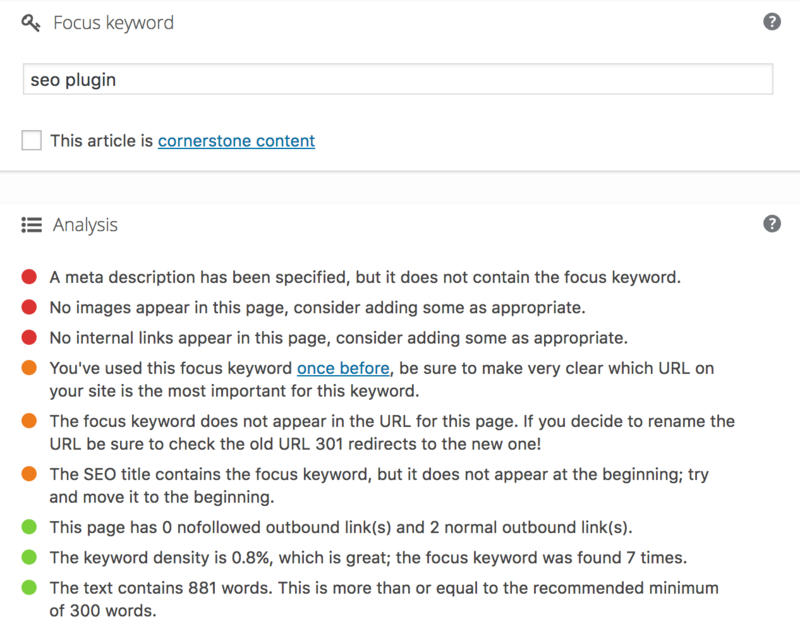 Add this keyword into Yoast’s “Focus Keyword” panel, and you’ll find that a whole new set of “Page Analysis” features pop up. We’ll be discussing this in more depth later in this article. From the Keyword tab, you’re also able to customize the snippet that will appear for your page’s search engine result. After getting familiar with the “Keyword” tab, click over to the next tab that’s entitled “Readability.” On this page, you’ll get a little bit of information from Yoast about how readable your content is based on a set of criteria. This section isn’t meant to cause any unnecessary stress in an attempt to get a perfect score. Instead, it’s simply there to give you an idea of how consumable your content really is. After moving out of this tab and the Content Optimization category as a whole, you’ll find that your next option is the “Social” tab. Under the social tab, you’ll find all of your options for creating integrations for both Facebook and Twitter. With the options here, you’re able to adjust titles, descriptions, and images for each network. Finally, after moving on from the “Social” tab, you’ll come to the “Advanced” tab. 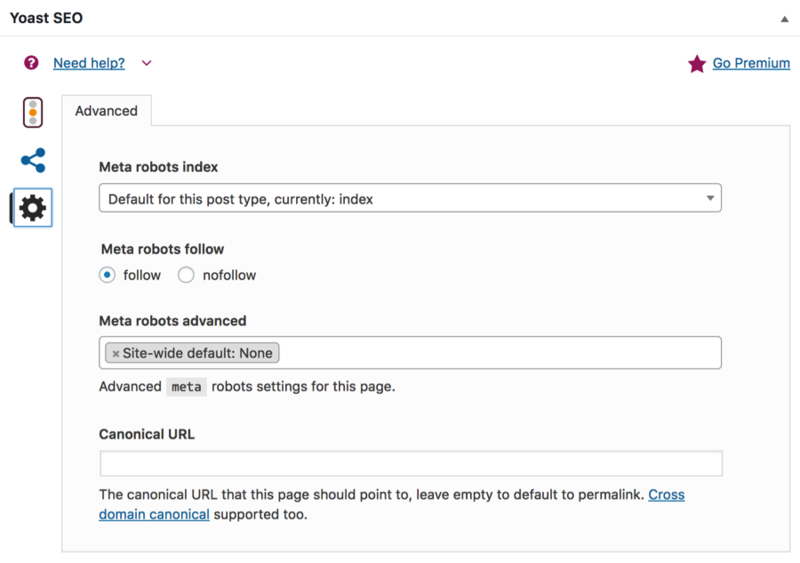 Here, you’ll find options for setting up a page as “followed” or “nofollowed” by search engines, as well as options for setting canonical URLs and index/noindex. All that being said, beginners should rest assured knowing that Yoast SEO works well out of the box. In most cases, it’s not necessary to mess with a lot of settings to get everything set up right. 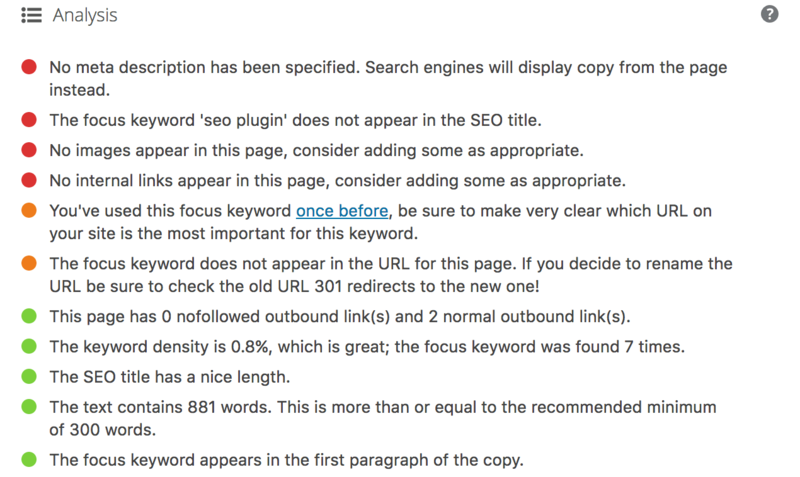 Like Yoast, All in One SEO Pack is available within the WordPress Plugin Directory. After installing and activating it, you’ll find that All in One integrates onto both your site’s “Edit Pages” and the list views of pages and posts. Hint: If you don’t see All in One’s options to set SEO titles and meta descriptions on the “Posts” page, you may want to ensure that it’s been activated for both pages and posts. Before diving into all of the settings that All in One offers on an editing page, let’s talk a little bit about what you can do from within the list view. Editing SEO titles and meta descriptions from here is something that All in One offers that Yoast does not. It’s easy to change these elements for many posts and pages all at once. However, the differences between All in One and Yoast don’t stop there. After clicking over to an edit page, you’ll be immediately struck by how different the All in One user interface looks. There are only two tabs, and all of the options you have are contained within them. On the “Main Settings” tab, you’ll find options for inserting meta keywords, changing meta descriptions, and choosing to nofollow/follow and index/noindex. In addition to these, you’ll even find a handy option to exclude a page from your site’s XML sitemap. The next tab is the “Social” tab. After clicking over to it, you’ll find that there are a whole lot more options than those that Yoast has. Like Yoast, All in One allows for the selection of images, descriptions, and titles that are unique to social media. However, these options are also accompanied by a host of additional features that focus more on the technical side of things. If you’re in search of advanced options for social integrations, you aren’t likely to be disappointed. Like Yoast, All in One works fairly well out of the box. However, it’s important that users look through the plugin’s settings to ensure that everything appears to be set properly for effective optimization efforts. 3. Overall Experience: Which Plugin is Easier to Use? Yoast and All in One are very different in this way. When utilizing Yoast, users should be aware that their options aren’t always neatly presented on a single screen. In some cases, it takes a little bit of navigating to find the right settings to work with. At the same time, the Yoast interface is very clean in appearance. It is not intrusive in any way and doesn’t appear to be sloppy or thrown together. It allows for SEO Title, Meta Description, and Meta Keyword updates to be made from the “Posts” and “Pages” lists within the WordPress dashboard. This means, of course, that batch editing is a whole lot simpler. With all significant settings being listed out in a single tab, it’s harder to forget simple things like “noindexing” a page or adding a meta description. Thus, it won’t be wrong to announce All in One SEO Pack as the winner with respect to overall user experience. 4. 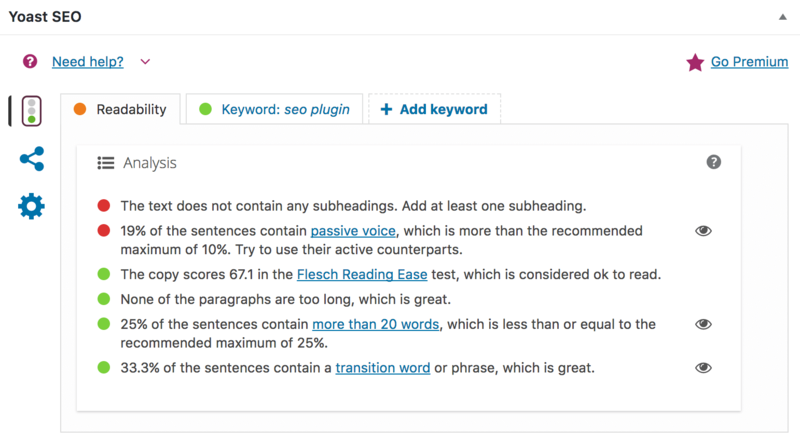 SEO Analysis: Which Plugin Helps the Most with Content Writing? In this feature comparison, the winner was clear. Yoast is known for its “Page Analysis” feature because this kind of tool can be hard to come by in any SEO plugin. All in One, for instance, does not have any kind of comparable feature. The Yoast Page Analysis tool is a great tool for both beginners and veterans alike. 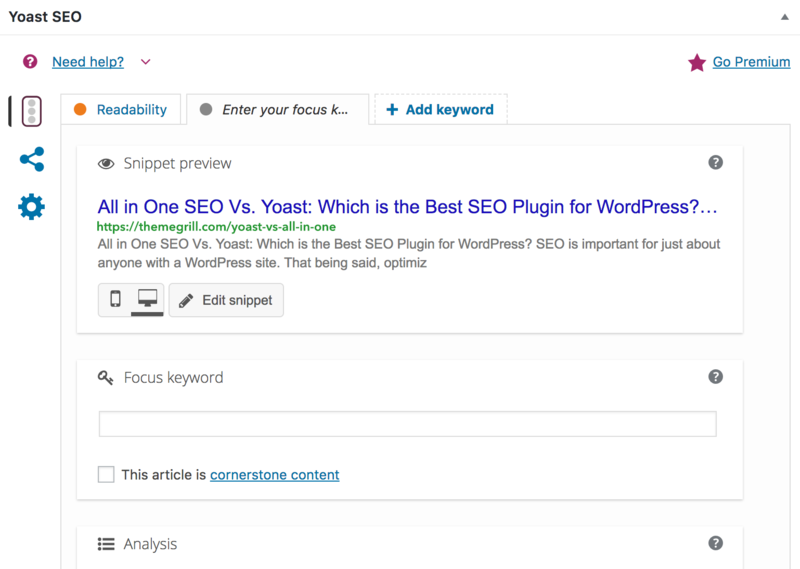 After choosing a focus keyword, the Yoast SEO plugin analyzes the content that you’ve compiled on a page. It then grades your work, telling you how you can potentially improve the page’s SEO performance. Surprisingly, that’s not all. In fact, the page analysis tool is extremely in-depth. While the score given for some specific factors may be irrelevant or inaccurate for your content in terms of your unique needs, the analysis does appear to be in keeping with SEO best practices in almost every case. Thus, it won’t be wrong to announce Yoast SEO as the winner for SEO analysis options with its powerful ‘page analysis’ feature. 5. Social Integrations: Which Makes It Easiest? Social media marketing is a big deal, and optimizing for it is extremely important. As an added bonus, both Yoast and All in One offer the ability to easily set up social integrations for both Facebook and Twitter. However, on All in One SEO, there’s an added benefit. 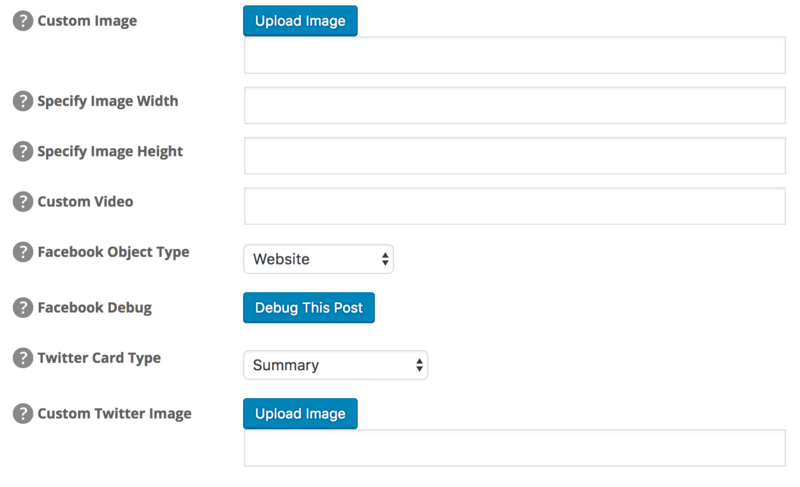 The plugin allows for Facebook debugging directly from WordPress. While that might not seem like a very big deal, anyone who’s had to debug links in the past knows that it’s quite an added hassle. That said, the two plugins work essentially the same for social integrations with the exception of this one small bonus. If you think about it, one of the biggest reasons to download an SEO plugin is the time that it can save you. However, in this case, the choice between All in One and Yoast isn’t very straightforward. Both plugins provide massive time-saving results. When it comes to batch editing, All in One is the clear winner. If your site is starting from 0 and requires widespread SEO-related updates, you’ll find that All in One offers the easiest way to institute these changes. On the flip side, Yoast’s Page Analysis feature can be a massive time saver in the long run. Its ability to catch mistakes, oversights, and optimization misses is invaluable. Thus, we cannot clearly state All in One SEO or Yoast SEO to be the winner in this regard. You can choose one according to your individual preference, i.e. batch editing or page analysis seems more useful to you. 7. Customer Service: Which Support System is Best? When it comes to customer service, we consider All in One and Yoast SEO to be on equal ground. Neither service provides personalized customer support for those who download the plugin for free. That being said, both Yoast and All in One do offer personalized customer support for those who subscribe to the pro plans. What kind of results do these plugins produce? Since Yoast and All in One don’t create content for you, testing results isn’t always easy. After all, it’s more important to ensure that your pages are well optimized with both great content and off-page signals. Both Yoast and All in One have a reputation for being effective. When you set meta descriptions, create SEO titles, and develop XML sitemaps, you can be confident that the changes you’re making through the plugin will be reflected on your site and in search engine results. With this considered, you can feel safe in choosing either All in One or Yoast. Neither plugin has a reputation for slowing down your site or creating security issues, and both are highly reviewed by the people using them. No matter what plugin you choose, you can be confident that it will produce results. Instead of basing your decision on this, look to the user experience and added features that you value most. In any SEO effort, the most important piece of the puzzle is remembering that plugins are a supplement – not a strategy. Both Yoast and All in One serve their intended purpose, but each offers unique efficiencies and features. If you’re looking for a plugin that works in an advisory role, helping you to master content writing and development, consider Yoast SEO as your solution. If you’d prefer to work with a plugin that’s stripped down and straightforward, offering everything you need in a quick and accessible way – All in One SEO Pack might be your best choice. Otherwise, keep in mind that there are a variety of other SEO plugin options that may suit your needs even better. All in One and Yoast are popular for a reason, but a few other plugins are rising stars. A couple has a great reputation, and it may be worth looking into the features they offer to see if there’s something that’s more important to you than the features Yoast and All in One present. In any case, focus on content – the SEO results will come no matter what plugin you’re using! Eric Johnson is a Digital Content Creator for FeedbackWrench. FeedbackWrench develops and implements digital marketing strategies for small business clients. We are a team of SEO copywriters and editors who work both individually and in the team. 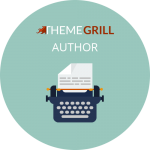 ThemeGrill author is where one of the editors here is working on one project personally or editing the guest posts. Write us @themegrill_blog in Twitter and +ThemeGrillBlog on Google+. ← WordPress Halloween Sale 2018: Get Amazing WordPress Coupons and Deals this Halloween! I didn’t use the all in one plugins but still i can say Yoast is better than all in one. WordPress is the most widely used Content Management System (CMS) for website construction. 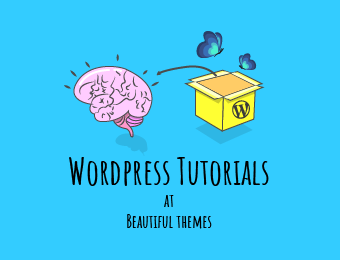 More than 26% of the world’s websites are made with WordPress, and when you consider the plugin architecture that makes WordPress so flexible, it’s easy to see why so many people choose this system to develop their site. Thanks for the very helpful post. Personally, I prefer the yoast to the all in one plugin. The yoast works more like magic. Just some few set up and booommm there it goesss. I love yoast it is very flexible and easy to use. I have been using All in One SEO since I started using WordPress which was about 2009 – before that we did our meta tags in our HTML markup! I have liked it – but recently have been hearing more and more on Yoast. I decided to switch specifically for the help with optimizing a page that Yoast gives. I am going to miss being able to edit Title, description and keywords from the “All Posts” and “All Pages” — plus even though the meta title and description imported over – I have to put in a main keyword and optimize each content page – this is going to be quite the project! Before reading this article, I was totally confused that which is better to use? Because both have good and useful features. But thanks to Themegrill Team. Now, I am sure which is works for SEO better. 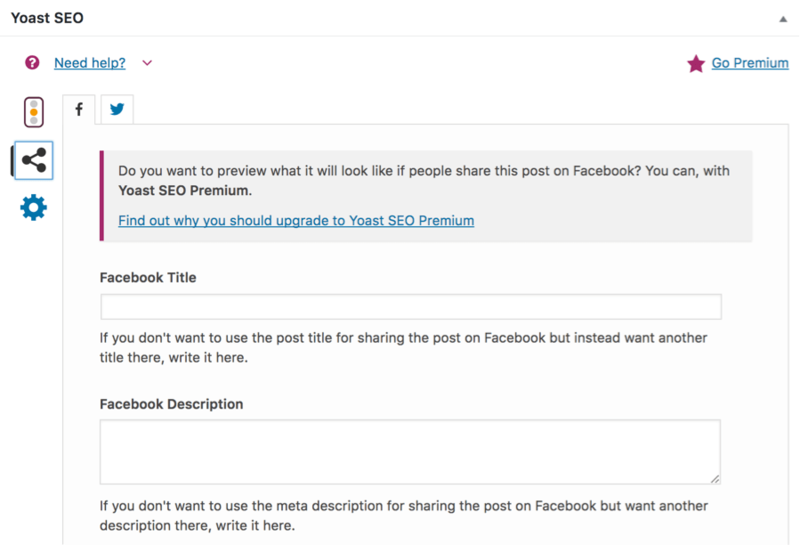 Great Compression….but like Yoast seo. It is most poweful seo plugin in WordPress repository. Thanks author for sharing this nice and informative post about the All in One SEO and WP SEO by Yoast. I have tried both the plugins and they both are great with powerful SEO features to give better WordPress SEO strategy. Keep up the great work! Thanks, author for sharing this nice and informative post about the All in One SEO and WP SEO by Yoast. I have tried both the plugins and they both are great with powerful SEO features to give better WordPress SEO strategy.